You are here: Home / Blog / Bible study / Should We Eat Lamb for Passover? Some of my closest friends served lamb at their Passover seders this year, and this post is not meant as a slander against them in any way. In fact, in the twelve years our family has been observing Passover, we ourselves have served or eaten lamb for at least half of them! It would be extremely hypocritical of me to accuse them of doing wrong when they might have even learned it from me! However, the Spirit used this as a teaching tool this year, to try to show me how to give mercy to others who are trying to obey the Law of God, even though we differ on the finer points, including those of my friends in former Baptist and Christian circles. In other words, He used this humble me. Let me show you why. It seems very straight-forward, doesn’t it? “All the firstborn males that come from your herd and your flock you shall sanctify to YHVH your God; you shall do no work with the firstborn of your herd, nor shear the firstborn of your flock. You and your household shall eat it before YHVH your God year by year in the place which YHVH chooses. But if there is a defect in it, if it is lame or blind or has any serious defect, you shall not sacrifice it to YHVH your God. You may eat it within your gates; the unclean and the clean person alike may eat it, as if it were a gazelle or a deer. Only you shall not eat its blood; you shall pour it on the ground like water. “Observe the month of Abib, and keep the Passover to YHVH your God, for in the month of Abib YHVH your God brought you out of Egypt by night. Therefore you shall sacrifice the Passover to YHVH your God, from the flock and the herd, in the place where YHVH chooses to put His name. You shall eat no leavened bread with it; seven days you shall eat unleavened bread with it, that is, the bread of affliction (for you came out of the land of Egypt in haste), that you may remember the day in which you came out of the land of Egypt all the days of your life. And no leaven shall be seen among you in all your territory for seven days, nor shall any of the meat which you sacrifice the first day at twilight remain overnight until morning. This is a passage removed by four books from the other passage, and it’s not immediately obvious. It also helps to read the entire chapter of Deuteronomy 12, which also explains where meat may be slaughtered and how it may be eaten. The “place where YHVH your God will choose” is Jerusalem, and He has placed His Name there forever. We cannot just eat the meat of a lamb in remembrance of the Passover wherever we would like. No, if we want to be obedient to the Torah, we must refrain from eating it anywhere else. You may not sacrifice the Passover within any of your gates which YHVH your God gives you; but at the place where YHVH your God chooses to make His name abide, there you shall sacrifice the Passover (Deuteronomy 16:5-6). In other words, in contrast to a short verse that seems extremely clear in its meaning, we deliberately chose what appears to be “disobedience,” so that we could obey the instructions given in a another passage of Scripture. Now, again, if that’s not how you saw it, and if you served lamb for dinner this year, don’t fret. I’m not condemning you! It is a big deal to the Father. He even says to the Israelites that if someone sacrificed a lamb anywhere other than the place He chose, they were to be cut off from the people of God. “Whatever man of the house of Israel who kills an ox or lamb or goat in the camp, or who kills it outside the camp, and does not bring it to the door of the tabernacle of meeting to offer an offering to YHVH before the tabernacle of YHVH, the guilt of bloodshed shall be imputed to that man. He has shed blood; and that man shall be cut off from among his people, to the end that the children of Israel may bring their sacrifices which they offer in the open field, that they may bring them to YHVH at the door of the tabernacle of meeting, to the priest, and offer them as peace offerings to YHVH. And the priest shall sprinkle the blood on the altar of YHVH at the door of the tabernacle of meeting, and burn the fat for a sweet aroma to YHVH. They shall no more offer their sacrifices to demons, after whom they have played the harlot. This shall be a statute forever for them throughout their generations” ’ (Leviticus 17:1-7). So this is serious. I hope you won’t do it again. However, I’m mentioning it because it occurred to me that this is exactly what our Christian friends do when they say they are obeying the Law of Christ, even as they disregard clear instruction in the Torah. They do desire to obey the Law of God, but they feel that parts of the Law have been set aside or done away with for this short season of time in which we live, known as the Church Age, even though they would agree that it was to be obeyed before the time of Christ and will be obeyed again during His coming thousand-year reign on this earth. For instance, they eat pork because Peter was told that it was now declared to be clean. It seems very straight-forward, doesn’t it? God has cleansed all the meat in the sheet, including all the creeping things that the “old law” of Leviticus 11 declared an abomination, and Peter is to rise up, kill, and eat it. However, they seemingly miss the longer passage, where we must do a bit of digging to get to the meaning, in contrast to a short verse that seems extremely clear in its meaning. When a writer of the New Testament begins to quote a passage from the Old Testament, we need to remember that he didn’t have chapters and verses to insert from specific books of the Bible. In addition, he was often working (amazingly) from memory of the Tanakh (Old Testament scrolls of the Scriptures), and as he starts to quote a passage, he is expecting that we will also start to quote from that passage in our minds. The beginnings of that quote are meant to refer us to the entire context and passage of that quote, so that we will clearly understand what he is saying. In other words, the New Testament writers are expecting us to have a working knowledge of the Old Testament. If we don’t have that, we should at the very least use the study tools available to us in this computer age and look it up and read it! So when Peter says, “Be ye holy,” he wants us to go back to Leviticus 11 and quote the entire passage, which also contains the phrase “Be ye holy.” In this passage are all the commands about foods we should not eat. Yes, this is the same Peter who had the sheet lowered in front of him in Acts 10. He is telling us that we are to continue to be holy by not eating unclean foods. Of course, in the same way that Yeshua would use commands from the Torah to go on to reveal deeper issues in our hearts (see Matthew 5-7), Peter was using the example of disgusting pig and shellfish to teach us many deeper heart issues that we need to be sure to cleanse, so that we are like Yeshua, our Passover Lamb, without blemish and without spot. So What about Lamb for Passover? Why was the Temple destroyed? Because of Israel’s sin and disobedience to the Law of God! As Yeshua bemoaned, not one stone would remain upon another of the Temple that stood gleaming in front of Him. Why would God do this to His people? Why would He make it so difficult for them to obey the Torah by scattering them across the earth? In Deuteronomy 30, we read that in future generations, the people of God would begin to realize that all of these curses had come upon them, and it would bring them to repentance. When they realized what they could have had — but did not, because of their own sin and the sins of their forefathers — they would turn around, repent of their sin, and begin to obey again. Yeshua knew the Temple was going to be destroyed, yet He gave His disciples instruction of what to do, even in that case. He was not instituting a new Law. No, He was upholding the old Law, given by His Father to Moses, which clearly instructed the people to only eat the Passover Lamb in the place where His Name had been placed. However, He also wanted them to continue to “keep the feast” of Passover and Unleavened Bread, as a perpetual statute and wherever they lived, in “remembrance of Him” and as a way to be annually reminded to keep the sin out of our lives. Yes, the Lamb is definitely a clear picture of Yeshua, our Passover Lamb, and we should teach this to our children. However, Yeshua also taught us that whenever we drink the cup and eat the unleavened bread, we also show His death until He comes. For the first-century believers, they continued to bring Passover lambs until the Temple was destroyed (disciples after the cross, Paul in Acts, references in Corinthians). 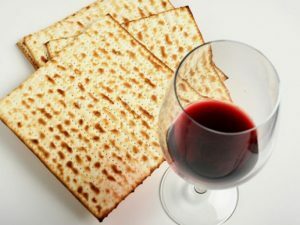 But they also began to take an everyday cup of wine and the Unleavened Bread that was eaten for seven days each year during the Feast of Unleavened Bread, and they began to teach that these were also to remind us of Yeshua’s shed blood for us (Isaiah 53, Matthew 26:17-30, 1 Corinthians 5:7-8, 1 Corinthians 11:23-26). Can you imagine their distress when the Temple was destroyed in 70 AD? They could no longer bring a lamb! However, history clearly shows us that they continued the tradition Yeshua taught His disciples. That tradition has been marred in many cases, blended to look like other pagan religions and brought into Catholicism, but yet it remains clear that Yeshua did tell His disciples to do it. So on the night of the Passover, as we start our seven-day observance of the Feast of Unleavened Bread nearly two thousand years later, we “eat this bread and drink this cup to show the Master’s death” until He comes. And He is coming again! He will restore all things, and according to Deuteronomy 30, the Father will bring us all back from where we have been scattered. He will restore the ability to fully and completely keep the Torah, removing the full curse of death and sin from us so that we can walk with perfectly circumcised hearts before Him (Deuteronomy 30:6, Jeremiah 31:31-34, Ezekiel 36:24-32). His Law will be fully restored, and we will finally be able to completely obey Him in every way. Sometimes I mourn that we live in this age because I so badly want to obey Him fully. Deuteronomy 30 says that would happen. I know that many Christians are mourning as well. They want to obey Him, too. Yes, they could start by throwing out the packages of bacon in their freezers, and I would certainly advise that. But for those of us trying to obey the Torah completely, let us not realize our sin only to run ahead of God by disobeying His other instructions. This happened in when they sent ten spies into the land but feared the giants rather than YHVH. After they repented, they determined to try to defeat the giants rather than accept that they would have to wander in the wilderness for 40 years, (Numbers 14:39-45), and it did not turn out so well. No, we need to take our punishment and wait for Him to bring us back to the Land. We all need to repent for the kingdom of heaven is at hand. Isn’t that the lesson we are to be learning this feast? Let’s clean out the leaven in our own hearts. Is He showing you some way in which you do not obey Him? Then repent and start to obey today! Is He showing you some way in which you wish you could obey but truly cannot yet, because of circumstances you wouldn’t even be in if you had never sinned in the first place? Then repent and beg Him to restore your life, to bring you back from your captivity. Because of the promises of Scripture, I can tell you that He will do that! It might not be today, but it will be soon, or else His Word is untrue. Meanwhile, obey Him in every way that you can, now, in the small ways, in the quiet ways, trusting, holding His hand, prayerfully. Show Him that your decision is true, as your eyes are to the skies, awaiting His return. Anne, this is such an amazing article! Thank you for sharing your heart. You have given me so much to think and pray about. Your blog helps me greatly to become obedient to YHVH. Thank you for all you do with your blog, Homeschool Torah, and the FB group. Good article Anne. I really appreciate your willingness to post your opinion on this topic. I hope it is okay to discuss and post a slightly differing opinion on the subject. Reading your article has caused me to ponder the subject more deeply and I’d like to post on an aspect that you didn’t discuss in the article. I think the first thing that comes to mind after reading this article is that your conclusion of not eating lamb at the Passover meal appears to be contrary to YHVH’s instructions that the Passover meal is to consist of lamb, bitter herbs, and unleavened bread. I understand that you express your reasoning for this in your article, but I think that we have to be careful to not allow an interpretation of scripture to lead us to an understanding that allows disobedience to plain commandments. My conclusion is contrary to yours in that I believe we are to keep the instructions of YHVH and eat lamb, bitter herbs and unleavened bread at Passover, even though we are not at the place of His choosing. Please allow me to explain why I believe this is true. I think we both agree that the scripture you referenced in Deuteronomy 12 and 15 refers to the offering and eating of the Pascal sacrifice. This Lamb was to be sacrificed to YHVH according to very strict guidelines and then eaten in the same manner. Once the lamb was sacrificed it became holy, it was sacred to those who ate of the sacrifice. This sacrifice could only be eaten by people of Israel (including those grafted in, covenant people), and any foreign males that were to eat of it needed to be circumcised. They could only partake of this sacred meal of the sacrificial lamb according to very particular guidelines and instructions. Since the destruction of the Temple in Jerusalem we have not been able to follow the instructions to eat of the sacrificial lamb as written in the Torah, because we cannot sacrifice the lamb in the manner described nor can it be eaten as described. So, what do we do? Do we no longer keep the Passover? As you suggest, do we no longer eat lamb at the Passover? How do we go about keeping it (Passover)? As I see it, we still do as much as we can (biblically) to remember the Passover without breaking any commandments. Deut 16:5 5 You may not offer the Passover sacrifice within any of your towns that the LORD your God is giving you, 6 but at the place that the LORD your God will choose, to make his name dwell in it, there you shall offer the Passover sacrifice, in the evening at sunset, at the time you came out of Egypt. We are instructed not to kill a Passover lamb (a sacrifice to YHVH) anywhere except where YHVH puts His name, but we can still memorialize the Passover and eat lamb, bitter herbs, and unleavened bread as the Torah commands. This is not the Pascal lamb as is described in the Torah. 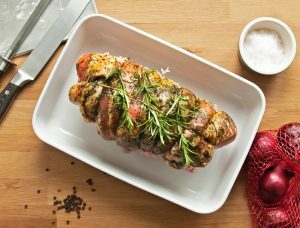 This lamb is butchered according to biblical standards of clean meat, but is eaten at Passover as a memorial to remember the real Pascal Lamb that was slain (which is Christ) and eaten according to Torah. Exodus 12:14 says this is to be a memorial 14 “This day shall be for you a memorial day, and you shall keep it as a feast to the LORD; throughout your generations, as a statute forever, you shall keep it as a feast. I believe that during the Passover it is entirely appropriate and should be encouraged to eat lamb, bitter herbs and unleavened bread as YHVH has commanded that we eat. I agree that we are not to eat the Pascal Lamb except in the place of YHVH’s choosing. The lamb we eat at Passover is not the sacrificial pascal lamb which was only to be eaten at the time and place described in the Torah. Instead, this is a memorial (butchered according to standards and biblically clean meats) lamb to be eaten to remember the true Pascal Lamb that was slain from the foundation of the world. This is why I believe it is not only permissible to eat lamb at the Passover meal, but is to be highly encouraged. Yah bless! !